Palm Warblers are fairly large in size compared to other warblers, and they are larger than Cape May Warblers. They also stand more upright and have a larger belly than most warblers. 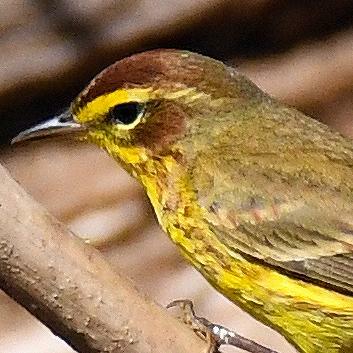 extends slightly over the eye, and and a yellow collar. 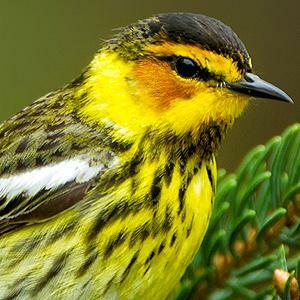 Both species have streaks on their breast, but Cape May warblers have black streaks, and Palm warblers have rusty ones. Cape May Warblers also have wing bars. Cape May Warblers may seem a bit darker overall than Palm Warblers.